This could be the video from any corporate. The point is that the video contains very familiar concepts and memes which can be marketed very easily. I have reviewed the development of the policy of ‘dementia friendly communities’ in the penultimate chapter of my book ‘Living well with dementia’. This definition doesn’t make sense to me as it ignores networks – networks (including social networks such as Facebook and Twitter) are particularly important to those whose physical or mental health might pose formidable barriers to being physically in any one place in a community. And immediately you see the problems. How large is a community? Or put another way what constitutes the boundaries of the community? In theory, a community could be members of a part of the Lake District, or the Square Mile. Being ‘friendly’ demands the question ‘how long is a piece of string’? Without some clarity, this construct is ‘motherhood and apple pie’ and a perfect tick-box vehicle for commissioners to demonstrate that they’ve done something about “dementia friendliness”. But simultaneously shutting down a day centre will immediately take out any feel good factor of commissioning decisions, leaving people with dementia sold down the river. And which dementia? There are about a hundred different causes of dementia, the most common one being globally Alzheimer’s disease, characterised typically in the early stages with real problems with learning and encoding new memories (and subsequent retrieval). So it’s conceptually possible to talk about dementia-friendly communities where you put up signage everywhere so people with Alzheimer’s Disease, who have spatial navigation difficulties, can get a bit of help. But not all memory problems are dementia, and not all dementias present with memory problems. But what those people with frontal dementia who have perfect memory, but who present with a slow change in behaviour and personality according to their closest ones? How should we make communities ‘friendly’ to them? The policy construct immediately experiences an obstacle in that it talks about ‘dementia’ as one great mass, an error previously made for ‘the disabled’. But this criticism is of course by no means fatal – as conventional communities also contain a huge range of people of all different characteristics, anyway. But is then the concept too broad as to be meaningful, such as “male friendly communities”? Something which Kate Swaffer, an Australian who has significant experience in campaigning for advocacy for people with dementia, and who herself lives with dementia, recently shared on Twitter was this eye-catching caption. And you see the difficulty? 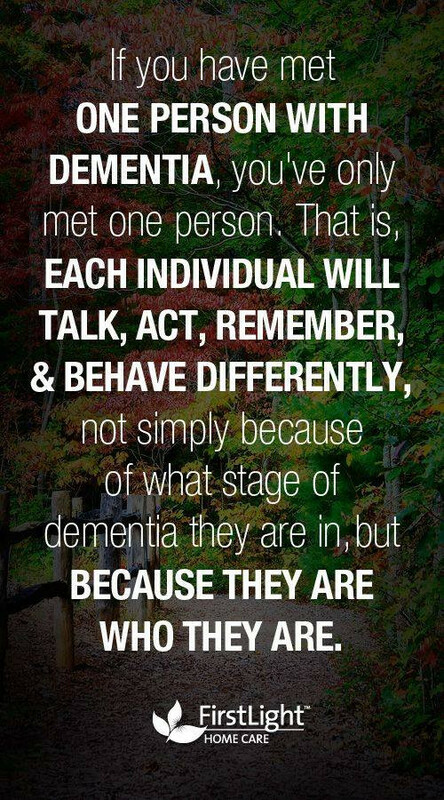 How do we design a ‘community’ which is ‘friendly’ to ‘dementia’, if you believe like me that once you’ve met one person with dementia, you’ve met one person with dementia? It’s clearly impossible to legislate for someone to be ‘friendly’ to another person in a society, however loosely defined, but it is worth at least acknowledging the existant law. You can’t have a policy that discriminates against a group of people to their detriment, with that group of people defined by a ‘protected characteristic’ under equality law in this jurisdiction. Dementia can fall under this protected characteristic definition, as legally it can come under the definition of disability; any discrimination of disabled people is unlawful. But you can easily argue that the policy fosters a spirit of solidarity far beyond rigid compliance with the law. Such solidarity of course seems somewhat at odds with the backlash against any form of state planning from this government and previous governments. I’ve thought long and hard about the need to try not to dismiss worthy initiatives in dementia policy. For example, whilst I am concerned about the error rates of ‘false diagnosis’ of people with dementia, I would be equally concerned if NHS England did nothing to try to identify who the undiagnosed with dementia currently are. Likewise, my natural instinct is to think about whether the charity sector is distorted with initiatives such as ‘Dementia Friends’. According to the Government’s website, by 2015, 1 million people will become Dementia Friends. The £2.4 million programme is funded by the Social Fund and the Department of Health. The scheme has been launched in England, and the Alzheimer’s Society is hoping to extend it to the rest of the UK soon. Linking the global policy of dementia friendliness to one charity, when other similar initiatives currently exist (such as the Purple Angels, Joseph Rowntree Foundation, University of Stirling, WHO, and RSA), means that many dementia charities may get unfairly ‘squeezed’. I do, however, intuitively and desperately wish this policy to succeed. 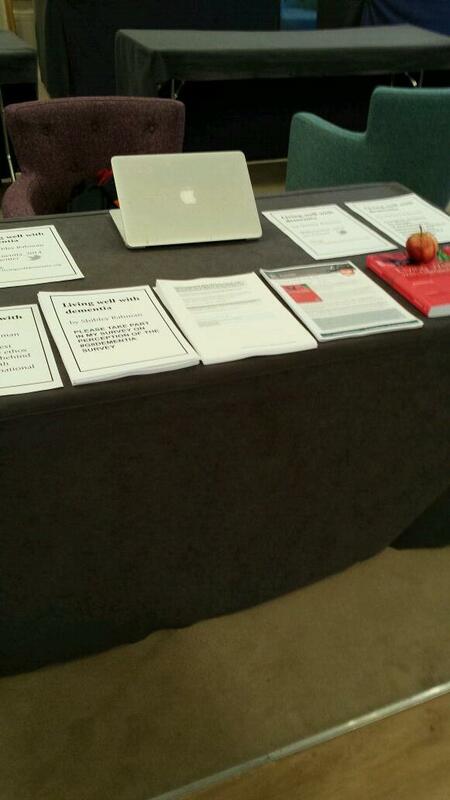 For example, at my stall yesterday at the SDCRN 4th Annual Conference (the Scottish Dementia Clinical Research Network), a person called Hugh actually bothered coming up to me to tell me how much being a ‘Dementia Friend’ meant to him. He talked about friends of his who were ‘Dementia Champions’. He spoke with tremendous affection about his late wife had lived with dementia for eight years, and the importance of community work to him. And it is very difficult to deny that initiatives such are this are truly wonderful. A real concern, though, is that by conceding one is building a ‘dementia friendly community’, even with all the best will in the world, the term itself doesn’t for me suggest or promote real inclusivity. It still sadly implies a ‘them against us’. I think I have this attitude because I’m physically disabled, and I would balk at the term ‘disabled friendly community’. It’s incredibly important that this policy is not London-driven friendly communities with more than a twang of tokenism. 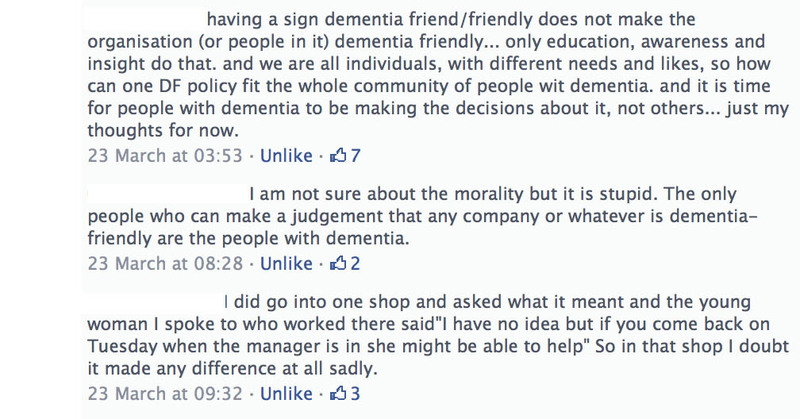 And surely you’d want businesses and corporates to be ‘dementia friendly’? But which corporates, and why dementia? Surely you’d want them to be friendly with rare muscle wasting diseases, or cancer, for example? Shouldn’t carers get their own “carers friendly communities”? This poses big problems for our perception of inclusive communities. Alastair shared a lovely picture which sums up the problem for me. You can easily see why certain corporates such as banks might wish to help out with this policy, because people with dementia can be at risk of financial abuse, but is this a genuine drive to help people with dementia or is it a pitch to secure competitive advantage like ‘ethical banking’. Apart from isolated stories such as of dedicated no-hurry lanes in supermarkets, for example, surely one would have expected supermarkets to have pulled out all the stops with adequate signage everywhere? Many large supermarkets have about thirty lanes where it’s easy for the best of us to get lost. I don’t think I’ve ever been to a dementia-friendly supermarket where the signage would be of a good enough quality to prevent a person with mild Alzheimer’s Disease becoming spatially disoriented. “Dementia friendly communities” lend themselves easily to ‘diversity marketing’, however. Diversity marketing is a marketing paradigm which sees marketing (and especially marketing communications) as essentially an effort in communication with diverse publics. As an acknowledgement of the importance of diversity marketing is that AT&T Inc. has a post for this discipline at vice president level. It is reported that, starting in the 1980s, Fortune 500 companies, government agencies, universities and non-profits organisations began to increase marketing efforts around diversity, according to Penn State University. 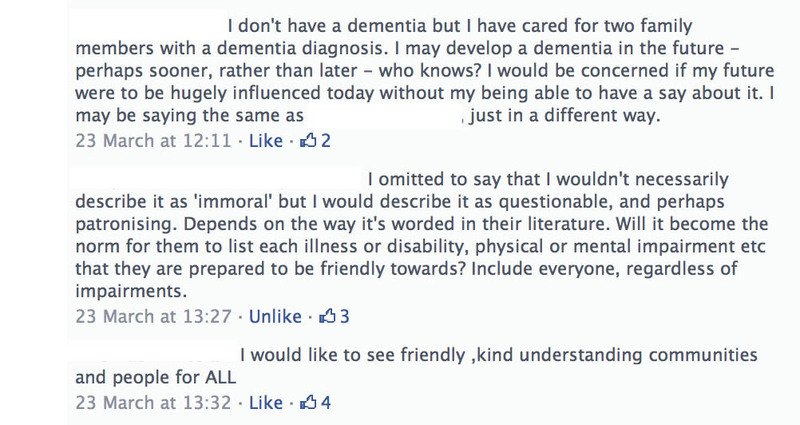 I asked my friends on Facebook whether there was anything particular ‘immoral’ about this diversity marketing in relation to dementia friendly communities, and their responses were as follows. In other words, there is no ‘right answer’. It’s clear to me that this policy, as it is currently being delivered, needs much greater scrutiny in terms of where the benefits have been, and for whom. “I’ve thought long and hard about the need to try not to dismiss worthy initiatives in dementia policy. For example, whilst I am concerned about the error rates of ‘false diagnosis’ of people with dementia, I would be equally concerned if NHS England did nothing to try to identify who the undiagnosed with dementia currently are.